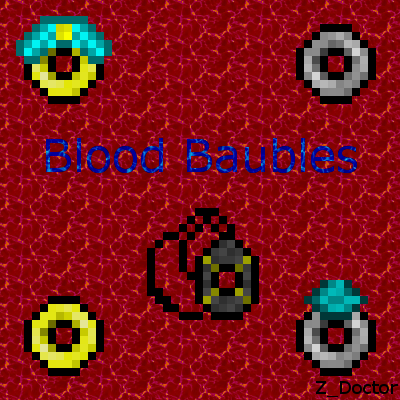 Blood Baubles is an add-on for Blood Magic that adds Blood Magic themed Baubles to the game. Downloads are in the downloads section. There are 2 types of rings: Iron and Gold. Every craftable ring will need one of these bases to be made. Typically, the Golden version will be stronger than the Iron equivalent. To make them, arrange the appropriate material in the pattern below. God's Gift comes in two variants Inactive and Active, with the latter being needed for it to do anything. While an active version is being worn, if the wearer takes any damage that would otherwise kill them, at the expense of its charge, the ring will negate the damage and heal the user. Essence rings are very forgiving and come in many flavors. They are an emergency reserve of LP outside your Soul Network. What's more is that they are wearer friendly, meaning that they will work on anyone wearing them. They act as a fail safe for when your LP is running low and will either lessen or negate any damage you would have otherwise incurred had you not been wearing them. Charging them is simple enough, shift-rightclicking with them in hand will check how much LP they need and syphon it from the user (but only as much as to not cause the user harm). Hovering over them will display their current charge and max capacity. Depending on the base ring and Blood Orb to craft them (the Blood Orb gets consumed), various storage sizes can be made. The current implementation is the Iron Ring will be the same as the Blood Orb while the Golden version is 25% bigger. Crafting them follows the same rule across all essence rings, with a Blood Orb above a base ring in the crafting table. All orbs can be crafted into essence rings except for Archmage Orbs for some reason. Rune Rings - Portal runes you wear on your finger. Seer's Pendant is a must have for any Blood Mage. It allows the wearer to see information of any Blood Altar from a distance. It shows the current amount of LP and the max capacity on the first line. The teir on the second. And if you are infusing, it tells you your current progress and the amount of Blood needed on the third line. With Blood Orbs, it shows the current essence of the owner and their max essence. If an item that doesn't have a recipe is placed, then it will display "???" or if a Blood Orb needs a higher teir to charge, it will let you know and which teir it needs. No warranty is given for users (and no liability is given to the author) who use this mod and suffer damages either directly or indirectly caused by this mod (broken world, hurt feelings, etc). Send Bug Reports, comments or suggestions to [email protected] or leave a comment below! Creative Tab displays old name "Magic Baubles" will fix in the next update. You don't take credit for my work. (Leave a link to the forum). 'I', 'me' and 'my' both refer to me 'Z_Doctor' and me the person. The mod and all other mods I create are my intellectual property. The source is provided for educational purposes. You may modify and recompile for personal use (I.e. Personal Servers, Youtube Videos, among friends) you may distribute the modify work among said friends as long as its not for money, profit (exception being for videos as long as credit is giving and personal adfly links are not used) or distributed publicly, credit is given to me where appropriate and does not violate the spirit of this mod policy. I do not claim credit for Required Mods and all credit goes to their respective awesome authors. You are free to make Spotlights of the mod (modified or not) as long as it follows the mod policy and the distinction is made. The road of a modder is one we love to hate. But I love it more when things work. Keeping an eye on this...it may be useful..
Any suggestions would be helpful. I may need to play with the mod more to get some ideas. Perhaps you could set something up that detects sigils socketted into Bound Armor, and have pendants that give discounts for use of specific sigils. Not a bad idea. Will work on after I finish a pendant that displays text over nearby altars of their capacity and current essence. I think that the Seer Pendant effect should be universal to all baubles added by this mod. It's a nice utility, and definitely something I would take if I could, but it's not something I can see anyone taking over cost reductions, additional LP storage, etc. It just doesn't have as much practical use. If I'm not mistaken, you mean I should add the gui effect to every bauble? If so I don't I like that idea. For that last part, you do know that Baubles has 4 slots. 1 for pendants/neck items, 2 for rings, and 1 more for amulets/belts. I guess I can understand the concern if there were more pendants. Plus using Baubles you can just wear them for their effect, not hold them in hand. I don't like the idea because it completely ruins the uniqueness of the SeerPendant (I worked hard to make it ) Plus it adds choice. I thought it appropriate since the ring saves your life and essential gives you a second chance. Perhaps I should put it in the starter chest with a free charge. I really don't think that's a good idea. I view Nether Stars as more of a midgame to lategame item, so giving the player an item that takes one seems like cheating to me. Perhaps you could add a new (cheaper and weaker) version that can only be used a once. 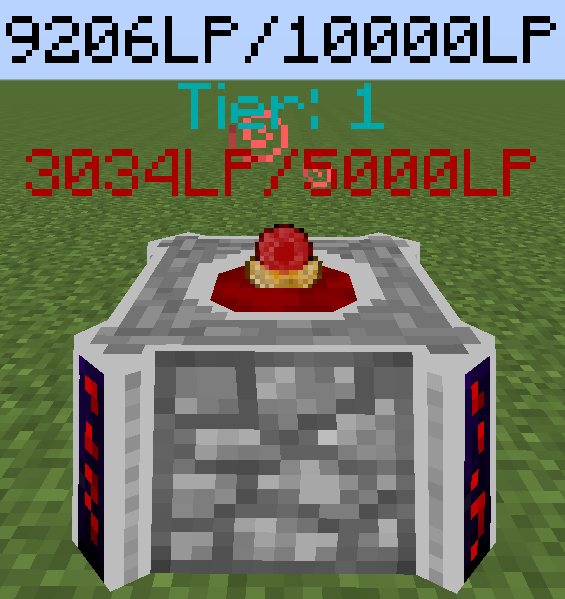 Recipe-wise, I think that two diamonds, an iron ring and 100k LP to charge sounds fair. This way you give the player a free revive without giving them what amounts to a free Nether Star, yet also giving them a reason to invest in the indestructible version. Plus, if a player doesn't want to use Blood Magic they don't have to stow that ring away. When it comes to actual ideas, I would like to see a bauble (a belt perhaps?) that, when charged, can extend the Omega State. I find it horribly annoying to have my armour run out of charge midway through a battle, hence the idea. Concerning the recipe, I would say that a life shard, a soul shard, a demon blood shard, a block of Glowstone, a bar of gold and four pieces of leather seems like a decent recipe. I'm not quite sure what the LP capacity or drain should be, but I'm sure you can figure that out. Thank you for reading and thank you for the mod. Should I update this mod?